You are here: Home » EUROPE-CANADA AND BACK… HOW TO FACE THE JET LAG? Heinrich Haussler (25 February 1984) is an Australian of German origin. He is an expert athlete who obtain some good results, such as one stage at the Tour, one at the Vuelta and the Australian Champion title. An athlete used to travel the world and face important journeys also for cycling. Talking with him is like accessing a huge database. 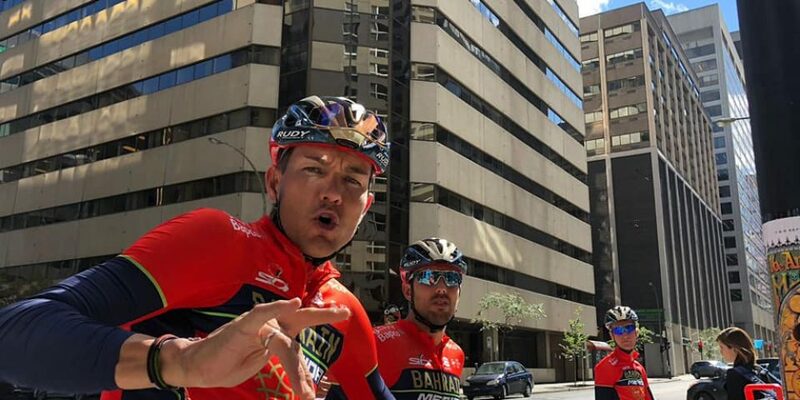 The athlete from Bahrain Merida team has just returned from the Canadian trip in Quebec and Montreal. Today he helps us to understand how to face these experiences that affect a lot of stress on an athlete. How many days do you need before the race and after the race to recover from the trip? “Coming to Canada it’s 6 hours time difference. Here we have faced 2 races, Friday and Sunday. We came in on Tuesday evening and this really does put a lot of stress on the body especially considering you have two and a half days to complete the assimilation of the time zone”. “Normally I think it takes six to seven days to adapt to the normal rhythm. Days where you have to sleeping good, find the right feeling with the bike and so on … but arriving two days before the race, it was really really hard to be mentally ready immediately “. Haussler reveals us some important pre-adaptation details. “If you have time or you are at home and your situation allows you not to work or you do not have to do anything else and you do not have any children then you can already start “adjusting the time”, maybe doing your workout very late in the afternoon and going to bed more late. The body is already thinking of change and you can adapt slowly to the new rhythm. As I said about sleep, you have to sleep even if you can not do it because of other family or work situations. Go to sleep very late, for example at two or at three and then sleep until eleven. As I said this is not for everyone, but in general I go to Canada for two races and we stayed there only seven days before returning to Europe “. The return seems to be simpler. “I find that getting back to Europe is always a bit easier”. What are the tips for cyclists who face certain commitments: “In addition to trying to adjust at home at the time zone, train yourself also when you land and remember to eat accordingly. For example, if you land in a country in a different time zone, in the morning, it’s really hard to try to stay up all day. That’s why we do a workout to stay in motion. You must try not to go to sleep early and stay awake for as long as possible so that your body can slowly adapt to the new time zone. “A lot of cyclists do this maybe three four times a year with Canada, Australia and other country. For me, Australia is even more difficult to deal with ten hours of time difference, which makes things even more complicated. When I was younger, I had less trouble adapting easily. However, even on this occasion the rule of a day of adaptation for every hour of time was worth. So in Australia you would need 10 days to adapt 100% to the new time “.